Thomas Loomes is a name well-known to those with an interest in the history of British clockmaking. He is not famous, in the sense that Royal Clockmakers such as Thomas Tompion were famous, but he was an important figure in the early years of the trade in London. He made lantern clocks, which was virtually the only kind of clock made during this early period - he was born about 1628 and died in 1665. There is one ancient report of a bracket clock by him, but I think this is likely to be simply a mis-used term to mean lantern clock. He worked at the famous (or later infamous) premises in Lothbury known by the sign of the Mermaid. The Mermaid might have been a tavern, but was more likely just a large premises where the business of clockmaking was carried out on the ground floor, and the staff members mostly lived in house, with additional rooms rented out to occasional visitors. The Mermaid is first documented as a clockmaking premises during the 1630s (but probably in that same trade in the 1620s), when it was occupied by the Selwood brothers, William and his younger brother, John. At that time there were probably no more than half a dozen clockmaking 'houses' in London, each run by a master with a staff of several workmen assistants (usually known as journeymen or sometimes called 'servants', the term meaning employees), as well as a handful of apprentices, youngsters between the ages of about fourteen and twenty one, who worked for next to nothing in order to learn the trade. Apprentices were always considered a cheap form of labour. In the 1620s it is doubtful whether the number of qualified clockmakers employed in the trade exceeded twenty. To be able to ply his trade in London a master had to be a freeman of a City Company, which gave him the 'freedom' to set up in business. This was the official position, though many traded without it - some were prosecuted for doing so, but others got away with it. Some early clockmakers were members of the Blacksmiths' Company, but membership of any Company would do, and it happens that the Selwoods were freeman of the Clothworkers Company - probably by virtue of the membership of their father or some other relative. The Clockmakers Company was established in 1631, supposedly formed to try to protect native British workers from cheaper or allegedly inferior work being peddled in unfair competition by foreigners working in London, principally Frenchmen. In actual fact many of those who between them formed the Clockmakers Company were themselves French, and for the next twenty years or more 'foreigners' dominated the Company proceedings, bending the rules to suit their own advantage and rotating the senior offices amongst their own clan. It seems to have been a cross between a closed-shop trade union and a gentleman's mafia. Strict rules about how many apprentices a master could employ were broken by the Company seniors and enforced against the common membership. Many clockmaking houses were based closely on family relationships - brothers, sons, sons-in-law, brothers-in-law, nephews, uncles - and each family group would find ways to bend the rules as best suited the family as a whole. The Company also controlled ancillary workers such as engravers, watch case makers, spring makers, perhaps even brassfounders. William Selwood joined the Clockmakers Company in 1633 (though was making clocks well before that date, probably as early as the late 1620s); his younger brother, John, joined him a little later, about 1640. They had between them several apprentices, some taken with the approval of the Clockmakers' Company and some taken earlier through the Clothworkers Company. Like so many other clockmakers, they probably also had apprentices employed without any kind of official consent. The Selwoods made lantern clocks, which were (pretty well) the only kind of domestic clock known at this time.These clocks seem to have born William's name, as master of the business, though one is known signed by John. Amongst these apprentices were some who themselves later became well known as lantern clock makers, principally Thomas Loomes, Thomas Knifton, and Edward Norris. Thomas Loomes was probably related to John Selwood through Selwood's wife, Dorothy Brooks, whom John married in 1642. The Mermaid was one of the major centres of lantern clock making for nearly half a century, till it finally closed in dramatic circumstances in 1666. 1. Frontal view of Thomas Loomes lantern clock. Click for closer view. John Selwood died in 1651, quite a young man of about thirty-eight, apparently childless; William died early in 1653, a bachelor, aged about forty-six. This left their former 'senior' workman, Thomas Loomes, in sole charge of the Mermaid business at the early age of only twenty five after only three or four years of qualified practice, a cause of envy for some more senior clockmakers elsewhere, who were less fortunately placed. Thomas Loomes's lantern clocks probably date from 1653 or later, as he would probably not have been allowed to sell his own clocks when working under William Selwood. Of course, Thomas Loomes still had not only his own apprentices but those of the two deceased Selwood brothers, meaning that we was considerably over quota, an irritation to the senior members of the Clockmakers' Company, who felt they might themselves find ways to circumvent the system themselves but could not tolerate it in others. The Company irritation at Loomes was aggravated the very next year, 1654, when Thomas Loomes married Mary, the twenty-year-old daughter of Ahasuerus Fromanteel, master of a thriving clockmaking house in Mosses Alley in Southwark, south of the river Thames, where he was more or less beyond the control of the Clockmakers' Company. This was the same Fromanteel who was shortly (a year or two before 1658) to become the most famous clockmaker of all time in so far as he was responsible for making the first clocks in Britain to be regulated by a pendulum. 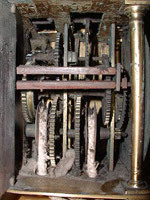 All previous clocks were controlled by a balance-wheel regulator, which was less exact as a timekeeper. The two houses of Fromanteel and Loomes were thenceforth combined, the one outside the law as far as the Clockmakers' Company was concerned, the other flouting it. Add to this brew the fact that politically the Clockmakers' Company was controlled mostly by Royalists (included amongst them the officeholder of 'Royal Clockmaker' named Edward East, believed to have been a practising Catholic), many of them of French origin or extraction, of Roman Catholic origin or belief (public or concealed), whereas Loomes and Fromanteel were of Protestant origin, had very strong Cromwellian links and even gave them financial support, and here was clearly a recipe for disaster. The years of 1653 to 1657 were ones of increasing strife between the two factions. South of the River, Fromanteel could to some extent go his own way regardless of the Company, whose authority did not extend that far. But he could not legally trade within the city. To get around this he traded both from his own premises at Bankside and through Thomas Loomes's house at the Mermaid in Lothbury. To trade within the city Fromanteel needed freedom of the City of London, for which he needed to be put forward by a city Company. The hostile administration of the Clockmakers' Company were never likely to do that - he had been a member of the Company for twenty-four years already and had still not been proposed by them for City freedom. Instead he was uniquely sponsored for City Freedom in January 1656 by no less a person than Oliver Cromwell himself, who wrote a letter which 'ordered' the Court of Aldermen to grant his freedom. This they did at once, as not many defied Cromwell. The Clockmakers Company must have been fuming. Fromanteel became a City freeman in spite of the Clockmakers' Company, not because of it. In his famous advertisement of a couple of years later (1658) for his revolutionary new pendulum clocks, which he claimed 'go exact and keep equaller time than any now made', Fromanteel offers these for sale made by himself 'who made the first that were in England' . 'You may have them at his house on the Bankside in Mosses Alley, Southwark, and at the sign of the Maremaid in Loathbury, near Bartholomew lane end, London'. This advertisement appears in the same issue of the journal 'Mercurius Politicus', which reported Oliver Cromwell's funeral. Matters came to a head in 1656, when a considerable group of thirty three 'rebels', headed by Thomas Loomes and his father-in-law, Ahasuerus Fromanteel (now a full freeman of course and the more able to make a fuss), signed a petition to the Lord Mayor complaining about the unjust administration of the Clockmakers' Company, especially that, whilst the Company was formed to keep out foreigners, Frenchmen were 'admitted to rule the Freemen'. The rebels included: Fromanteel himself; his son-in-law Thomas Loomes; his brother-in-law Andrew Prime; Richard Beck and Simon Dudson, who were former Selwood apprentices at the Mermaid; watchmaker John Drake, a Blacksmiths' Company member for over half a century already and a man with a fiery temper and a colourful turn of phrase, who at one time called on of the wardens 'a turd and a shitten fellow'. 2. Detail of the signature Click for closer view. Fourteen of the administration members signed a counter-petition, but the most senior names in the first draft, including that of Edward East, were omitted on the final. At this time the senior administration offices rotated amongst a handful of men, who conveniently re-elected each other in turn to retain control of the Company. They decided to make an example of Thomas Loomes - probably because they could not easily attack Fromanteel in Southwark, which lay beyond the arm of the Company legislation. They fined Thomas for having five apprentices against the permitted two. In fact as far as I can calculate at this time he had eleven apprentices and an unknown number of journeymen. There was an explosive meeting, which Fromanteel also attended. With his usual masterful turn of phrase, Fromanteel later wrote to apologise - in March 1657, the letter still surviving in the Company archives. Things had been said on both side, he wrote, which 'did not become Christians nor Civil men'. He apologised for having told the Company Assistants, who complained of Thomas Loomes having five apprentices, that any one of his journeymen could do more than any five of them put together. He should not have said that, he conceded, even though it was true! Cromwell's death in September 1658, with the resultant loss of an important source of support for his cause against jealous Company administrators, may have prompted Fromanteel to publicly advertise his new pendulum clocks, which he claimed had been 'examined and proved before his Highness the Lord Protector (i.e. Cromwell) by such Doctors whose knowledge and learning is without exception'.... His statement that he made 'the first that were in England' suggests that others are now making them, copying his device. Best to get his statement down on paper as being the one to first make them. The restoration of the monarchy in 1660 in the form of Charles II, caused havoc amongst Cromwellian sympathisers. Thomas Loomes was to suffer with others. We know of only a fraction of the political activity and I don't understand all of it, but the gist is that two former soldiers in the Parliamentarian army were on the run from the new Royalist law, hiding out at the Mermaid in Lothbury, concealed by Thomas Loomes. Ahasuerus Fromanteel and Thomas Loomes both had connections with Parliamentarians in Newcastle on Tyne, where Fromanteel's son, Abraham, soon was to move to ply his trade, probably to escape aggravation in London from the Clockmakers' Company, amongst other things. One Lieutenant-Colonel Paul Hobson of Newcastle and Captain Gower, former soldiers of the Parliamentarian army with connections in Durham, were on the run, a warrant for their arrest having been issued by the Bishop of Durham, who claimed they were 'two of the most dangerous fellows in the North' and believed to be 'now at Thomas Loomes's in Lothbury'. Gower later told how he was with Hobson when the warrant came to apprehend them both, but that he followed the advice of the landlord (that is Thomas Loomes), who kept him in an upper room and thence led him into the street, that he went from one friend's house to another, in one of which he continued for four months without fire or candle although in winter, and only went out at night and then with his cloak over his face for fear of recognition. Eventually they were arrested, and Hobson spent some years imprisoned in the Tower of London. Thomas Loomes was also arrested but was released in November 1661 on bond of £1,000.00 to be of 'loyal and peaceable behaviour'. I cannot imagine that Loomes had £1,000.00., and it was probably Fromanteel who stood surety. One accusation against Paul Hobson was that he was acting as an 'agent for a German prince to carry away manufactures'. There may be something in this, for Fromanteel was shortly to move his business to Amsterdam, and already had clockmaking connections there with Huygens, who first applied the pendulum to clocks and who allowed Fromanteel to introduce the idea into England. Thomas Loomes worked on at the Mermaid till 1664, when he suddenly disappeared from the records. We know his wife was a widow in 1668. What happened to him is uncertain but we can guess. In 1665 the Great Plague struck London, accelerated by the hottest summer in living memory. By September the death rate is said to have been one thousand a day. The Mermaid workers and the Fromanteel family were struck by the plague. 3. Movement. Click for closer view. In 1665 Thomas Loomes disappeared. The last four Mermaid apprentices, alive in 1664, never completed their service to become freemen. Mermaid workman Edward Sedwell died in August 1665. By that time Fromanteel's second wife, Sarah, had also died, as had his brother, John. Those who could fled from London. Fromanteel himself left London hurriedly in an attempt to escape the plague, and set up house in Colchester. In 1665 he was obliged to leave there too as the plague had followed him. We learned later from an unrelated court case that he sold off many of his household furnishings in Colchester well below value rather than risk carrying them and the plague with him. One record suggests that he too caught the plague but survived, though disfigured by it. It is doubtful whether much clockmaking took place in 1665. One in seven is said to have died of the plague. Thomas Loomes and other Mermaid employees probably died of it, their bodies flung into a plague pit. In 1666 the plague was ended by the Great Fire of London, which destroyed the city and the infection along with it. Samuel Pepys was just one of a huge crowd who watched from the safety of Bankside across the river (where Fromanteel's premises still were) as the fire raged through the city and the whole of Lothbury, including the Mermaid, went up in flames. The Fromanteel story continued long after, but the Plague brought an end to Thomas Loomes and clockmaking at the Mermaid. Regarding Thomas Loomes's productive life as a clockmaker, we can assume that to have been between the years 1653, when William Selwood died, and 1665, when he himself died - not more then twelve years at most. At one time I thought that from the date of his marriage to Fromanteel's daughter (1654), he may have worked under the far more prestigious Fromanteel name, selling just Fromanteel clocks. But though we know he did sell Fromanteel's clocks at the Mermaid, contrary to Clockmakers' Company legislation of course, he must also have sold his own lantern clocks too, as otherwise his working life would have been no more than a single year, and that makes no sense from what we know of his surviving output. I have had special reason to note examples of Thomas Loomes clocks, and over the last forty years I have come across roughly fourteen, some passing through auction, some in private collections, some illustrated in books, some offered for sale. Most were genuine, though one or two struck me as suspect. I remember the first one I ever saw was priced at £100 and I couldn't afford to buy it, something I have regretted ever since. It is difficult to avoid double counting, but even so this is far too many clocks for a man who traded for only one year. Nevertheless this quite short working period between 1653 and 1665 is helpful in one sense in that it means we can pin down the dates of his clocks with considerable precision. This is something not at all easy to do by their stylistic features, because these are very varied. Most makers of lantern clocks did not keep to a particular style of chapter ring marking, dial engraving, finial pattern - in fact there is such great variety in the work of any one maker that one cannot recognise his work by its style. In this respect Thomas Loomes is no different from any of the others. The only consistent thing his lantern clocks have in common is that they were all made with hammers positioned on the right and balance-wheel control, and all those I have come across were converted later to a better form of time-keeping regulation using, hardly surprisingly, a pendulum - as in fact were almost all, if not all, balance wheel lantern clocks. This present clock is no exception. Made in standard size (about fifteen inches) originally with balance wheel control and alarmwork, the alarmwork removed, as it always was, when converted to anchor escapement long ago. The original hand is retained. This clock is very dirty, having not been cleaned for many years, presumably lying neglected for that period. This is exactly how a collector likes to see such a clock, as he can then decide personally how far to clean it.